Based on his previous books from a science satire and parody magazine, The Journal of Irreproducible Results, one might expect some humor and great writing. 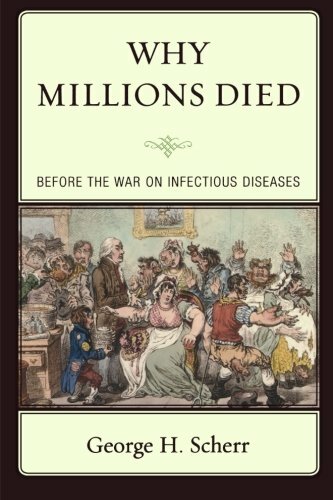 But Why Millions Died: Before the War on Infectious Diseases by Dr. George H. Scherr contains neither. It sets out to make the argument that millions died because scientists didn’t really listen to each other or work together and that the scientific community was slow to accept new theories—namely germ theory (the theory that infectious diseases are caused by microorganisms). Further reading reveals that it’s not about why millions died, but how one of the world’s greatest scientists repeated the experiments of others and took credit for the work—namely Louis Pasteur. The book spans history up to the late 1800s, scientific thought on cause of disease, and various inventions used in fermentation and filtering. In addition, there are detailed descriptions of the scientists’ experiments (with excerpts), and a ten-page–long bibliography. There is no index. In Why Millions Died, Agostino Bassi is rightly credited with being the first to describe contagion or germ theory. That has been said in other books, but not as forcefully; however, the chapter devoted to Robert Koch, the one solely responsible for Koch’s Postulates—our basis of epidemiology today—is only two pages long. The work of Robert Koch saved a multitude of lives, but is relatively ignored. Dr. Scherr tends to focus on Louis Pasteur and how he promoted himself on the backs of others. Interestingly, at least half of this book (I counted the pages) contained reproductions of experiments and inventions throughout history. The author additionally tries to discredit pasteurization and Louis Pasteur’s work on this by using recently published data. Dr. Pasteur didn’t have 21st century knowledge or tests at his disposal. To address the statement posed by the title, even if the delay in acceptance of germ theory was responsible for deaths, it was only 50 years’ worth. This pales in comparison to the thousands of years that people have suffered from infectious diseases. What made the greatest impact on mortality (and why millions died before this time) was the use of antiseptics in childbirth and surgery and the development and use of antibiotics in the 1930s. That’s the real way to address the title—but it is not the focus of this book. Overall disorganization makes Why Millions Died: Before the War on Infectious Diseases read more like a collection of thoughts and excerpts left over from many years of an interesting and curious career—but not a book that most people would enjoy reading.